The following information is an email response (Original is HERE: Foster & Peytons) I received from Adrienne Foster Potter, published here with his permission, email (coded) as “apnewz at yahoo dot com”. I have no information on these people, other than the TIMOTHY PEYTON who is in my PEYTON Book. 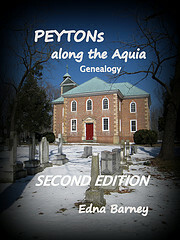 I know of no George PEYTON from the Aquia PEYTONS who went to North Carolina. I doubt that the Elizabeth PEYTON that Mr. Potter mentions from my book is related to his family. These PATTONS may be from Ireland, but I don’t really know. I am publishing it here to help the correspondant connect with the PEYTONs. I do believe there is a good indication that TIMOTHY PEYTON was related to Mr. Potter’s FOSTER family, but I know not how. Edna: Attached are my information and sources on John Patton b. 1777 No. Carolina, father of Sarah Royston Patton b. 1804. Sarah married a brother of one of my direct ancestors (Aaron Foster b. 1804 Nicholas, KY). I believe my information on John’s father, George Patton (b. abt 1745), came from ancestry.com. I also found George’s father there, named Robert Patton, b. abt 1720 Ireland, who married Unknown Espy, also born in Ireland. Apparently the 1880 Census of McLean Co., Illinois shows Benjamin Patton (son of John Patton), and states that his father was born in North Carolina. Aaron Foster, husband of Sarah Royston Patton, is the grandson of William Peyton Foster, b. 1747 Broadrun Estate, Prince William, Virginia. Since William Peyton has so many grandchildren named Peyton Foster, this seems to be a big name in our lineage. It’s also highly interesting that William Peyton Foster and Timothy Peyton were such good friends. I am very interested in the deed you mentioned regarding Timothy Peyton and a FOSTER in PW County. If you happen to locate it could you please email me a copy, or let me know where I can find the original? I would be very grateful. “General Bartholomew (a revolutionary war veteran and an early settler of McLean, Ill) believed in preparedness, hence he advised the building of rude forts, or block houses as means of defense. One such was erected at the home of John Patton near Selma in Lexington Township and the Henlines also erected one.”-History of McLean County, Illinois, by Jacob L. Hasbrouck, pg. 111 1880 Census of Lexington, McLean Illinois, of his son Benjamin, it states that John Patton was born in North Carolina. “#3, John Patton, son of George, was born in North Carolina, and moved to Garrard County, Kentucky. Here he acquired land, and built his first home. Here too, he met and married Margaret Wiley, pg. 136, and their first seven children were born. After a wet miserable drive, the Patton convoy arrived in McLean Co., Illinos, November 1827. With John was his son-in-law, Aaron Foster, who was lucky enough to get food and shelter for his family by doing chores for a settler. The Pattons were not so lucky. They wintered in a pole cabin, with their small children. There was no fireplace or chinking between the logs. They did their cooking out-of-doors, and their living quarters were little better than living outside. The Pattons and Aaron Foster moved into some apparently abandoned Indian teepees, and began cutting logs for a cabin. The first trees felled were of walnut, due to its resistance to ground contact and termites. While they were thus employed, the Indians put in an appearance. They had not abandoned their town, as John Patton had thought, but had been in their winter camp, hunting throughout the winter. Insert by Adrienne Potter: The Kickapoo Indians had earlier kicked out other white families, such as John Hendrix, the Dawson family, Thomas Orendorff, and the Rhodes family. The Kickapoo chief, Machina, told them, “too much come back, white man, t’other side Sangamon.” These things appeared a little threatening, but the settlers refused to leave and were not molested. It is the almost unanimous expression of the settlers that the Indians were the best of neighbors. They were polite and friendly, and old Machina was quite popular among the whites, especially with the women, . He was particularly fond of children and this touched their motherly hearts.” McLean County was plagued with green-headed flies that bit in the summer time, so severely that the people had to stay indoors. Wolves were a problem, as they attacked the sheep and hogs, and bounties were put on their heads. The prairie grass was very tough and took a team of oxen to plow it under. From “The Good Old Times In McLean County Illinois,” McLean Chapter, pg. 3. Back to “Seedlings of William Foster” pg 131. “The cabin was erected on June 10, 1829. During the so-called Black Hawk War, John built a blockhouse near the end of this cabin. Later the two buildings were roofed over into one house, and a lean-to was added. The original cabin stood on the same site for 136 years, and was used as living quarters for over 100 years. During June of 1970, my wife, Marie, and I visited the site of the old Patton Settlement. It is located on the banks of the Mackinaw River, 5 miles southeast of Lexington, Illinois. All that remains of this settlement is the beautiful Pleasant Hill Cemetery, where the town of Pleasant Hill – Selma once stood. It is a beautiful land of pleasant woodlots and rich farmlands, a fitting monument to those old settlers who lived and are buried there. John and Margaret Patton, and all their children, including Aaron Foster’s wife, Sarah R. (Parron) are buried in the Pleasant Hill Cemetery. This is a letter I received at my bookstore at Lulu.com/ednabarney from Adrienne Foster Potter, published here with permission, email (coded) as “apnewz at yahoo dot com” . 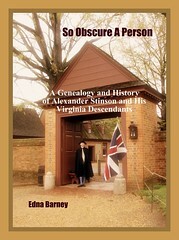 I responded about the possible FOSTER connection to the PEYTONS, as I do have reference to a deed of Timothy PEYTON to a FOSTER, on 6 April 1785, in Prince William County, but I have never pursued that. That deed probably doesn’t state relationships, but perhaps it may offer some clues. It would be in the records of Prince William courthouse. I am not familiar with the John PEYTON (PATTON) described. I don’t know of a John PEYTON, born 1777 in NC. Perhaps someone else reading here will have some information. Perhaps he was from Ireland or from the Gloucester County PEYTON family, which I’ve not followed. “31 July 1844. Bourbon Co., Ky. Ann T. MALLORY of said county, aged about 68, declares she was born in Prince William Co., Va., and was raised there until she was ten years old. One of her neighbors Leonard HART had a daughter Sarah HART who married William FOSTER in the fall of 1784. She was at the marriage and saw them married. The next spring in June 1785 her father and his family and Sarah and William FOSTER all came together to Bourbon Co., Ky., and settled not far apart. Sarah FOSTER had a child twelve or thirteen months after she was married and her name was Mildred FOSTER and she married Minor HART and now lives in Fayette Co., Ky., and must be 58 years of age. Afterward Sarah FOSTER had several children; some live in Illinois, Missouri and others in Kentucky. She has her father’s account book starting the day they started to Kentucky and it states 2 June 1785. Sarah HART was married to William FOSTER the year before, she thinks in the fall of 1784. They lived together until William FOSTER died, about 17 years past. Sarah married Moses BAKER and she has understood that BAKER died last winter or spring. William and Sarah lived on her father’s farm for many years and when her father, T. PATIN, was killed by the Indians, William FOSTER was one of the men that went and brought him home. Even more interesting is that a number of Pattons are found in our family genealogy, who are probably also related to the Peytons. In 1824 Sarah Royston Patton (b. 1804) married Aaron Foster (b. 1804 KY), a grandson of William Peyton Foster b. 1747 (above), and the son of Harrison Foster and Anna Margaret Bartlett. Saray Royston Patton was the daughter of John Patton b. Abt 1777 North Carolina (d. 1845 at the Patton Settlement, McLean, IL) and Margaret Wiley b. 1781 MD. John Patton b. Abt 1777 was the son of George Patton b. Abt 1745, who could very well be one of the George Peytons in your book. The reason I believe this is that the Fosters also came from Prince William, VA. The grandfather of William Peyton Foster b. 1747 was William Foster b. 1686 at the Foster Estate at Broadrun, Prince William Virginia. He married Hannah Elizabeth Unknown. A number of their descendants were named Peyton (not Patin, not Patan). I suspect that Hannah Elizabeth was the Elizabeth Peyton b. 1687 mentioned in your book on pg. 27, because Hannah was a nick-name for Elizabeth much like “Polly” was a nick-name for Mary. John Patton b. abt 1777 and his wife Margaret had 11 children, on which I can give you more information if you are interested. In his book “Seedlings of William Foster,” Book II, pg. 6, by Flavius Foster, he writes that William Foster and Timothy Peyton were neighbors in Prince William, VA, who emmigrated together to Bourbon County, Kentucky, where the Peyton Station was founded. They lived on the station until 1805 and several of their children were born there. I believe William and Timothy were not just neighbors, but may have been cousins. If your email provider cannot control SPAM and has no way for you to allow people you write to, to respond to you without insulting them, then you need to get another email program. I use Gmail and I don’t see ANY Spam coming through to me. And no real people go into my Spam folder either. Furthermore, as far as I am aware, Gmail does not allow Spammers to use Gmail, so there is no reason I should be considered a Spammer. All material here is subject to ©copyright. Unless attributed to others, all written text is ©copyrighted to this site's author, Edna Barney.